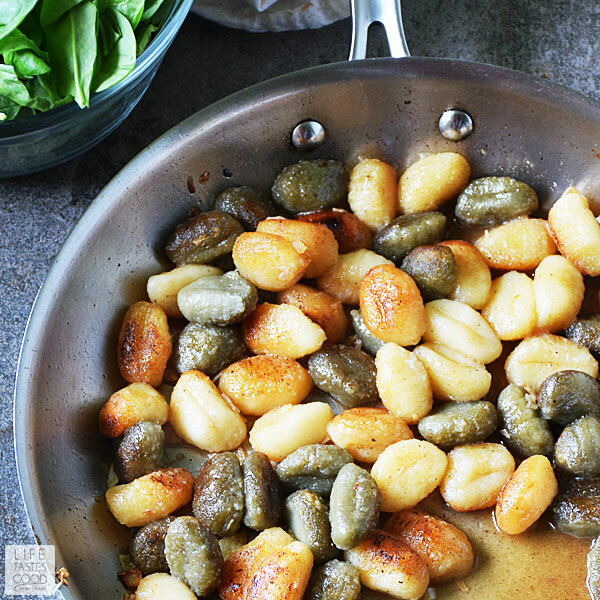 Pan Fried Gnocchi with Spinach and Parmesan is an easy recipe using fresh ingredients to maximize flavor. It makes an impressive meatless meal that whips up in no time, or pair with your favorite protein for a hearty side dish. 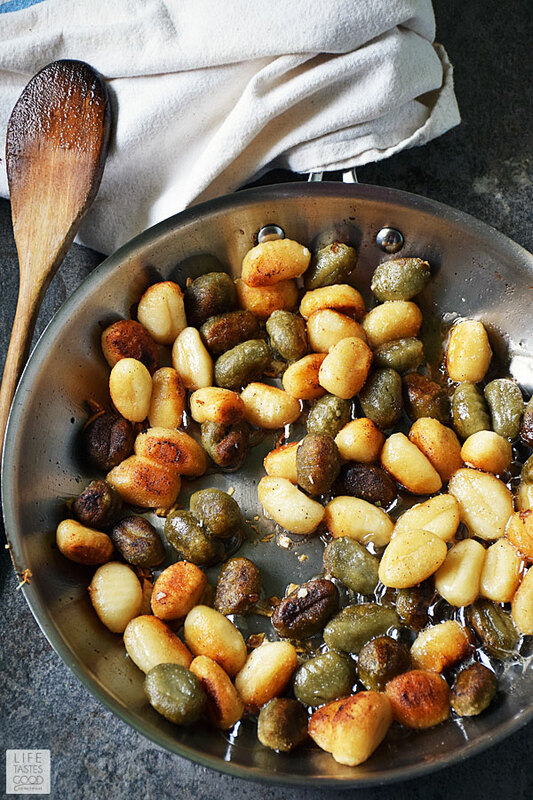 I partnered with Alessi to develop this gnocchi recipe. 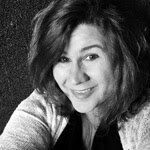 I regularly use Alessi products, so I am happy to participate in this project and share my love for gnocchi with you. As always all opinions are my own. 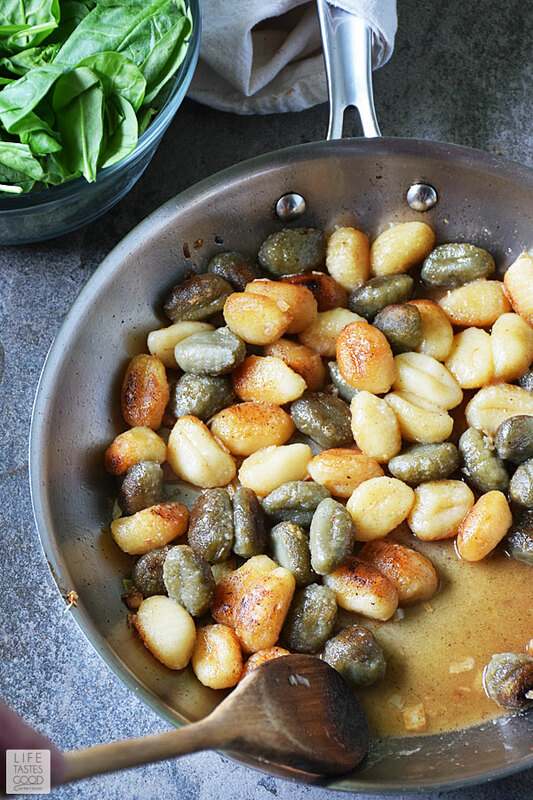 Pan frying gnocchi is probably my favorite way to enjoy it. I love the crispy, golden outside, while still having a soft and pillowy inside. 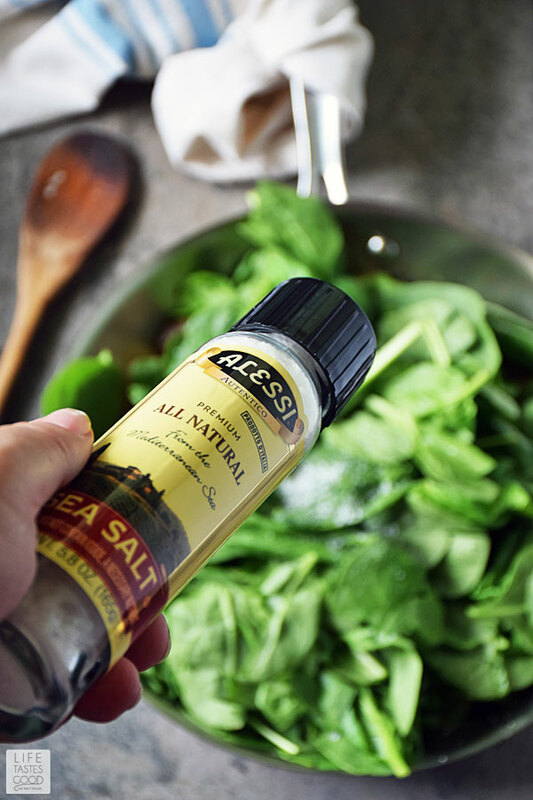 Combined with a buttery white wine sauce, fresh spinach, and Parmesan cheese, this is an easy dinner recipe I can have on the table in 20 minutes y'all!! I'm not kidding! This is a go to recipe on busy nights. It's quick and easy without sacrificing flavor. I like that!! I was inspired to use the spinach and Parmesan flavor combo by my very popular Orzo Pasta with Spinach and Parmesan recipe. You'll definitely want to give it a try too! Packaged gnocchi has come a long way, so I don't really feel the need to make it homemade. 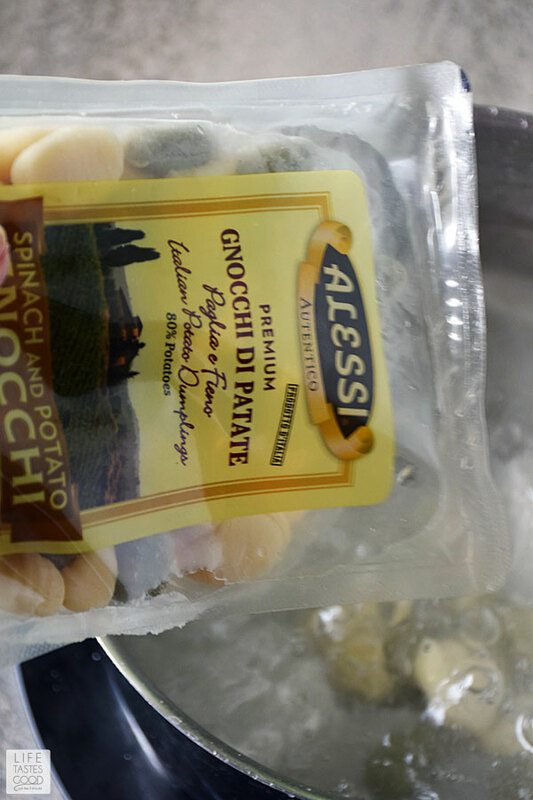 I really love the ease of just purchasing the package, and the spinach and potato gnocchi by Alessi is one of my faves! It is believed that gnocchi was the first type of pasta to be eaten by Italians. Theory has it that bits of dough made of flour and water were pinched off and shaped with the tines of a fork and then dropped into boiling water. These small dumplings cooked quickly and their texture allowed sauces to readily adhere. 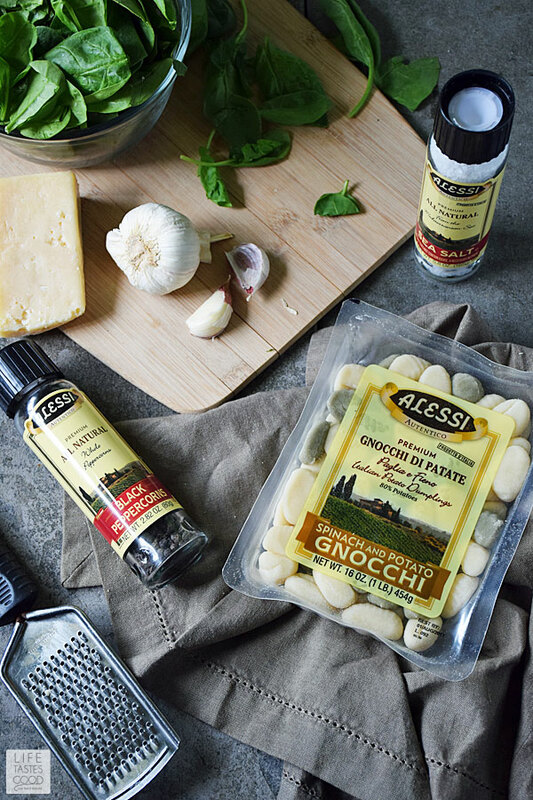 Thankfully, Alessi Gnocchi is readily available in grocery stores and easy to make. I like to first boil it quickly and then pan fry it for a crispy outside and toss it with a white wine sauce. It makes for an easy and impressive meal any night of the week! Season to taste and top with freshly grated Parmesan cheese. That's it! Easy peasy!! Boil gnocchi according to package directions. 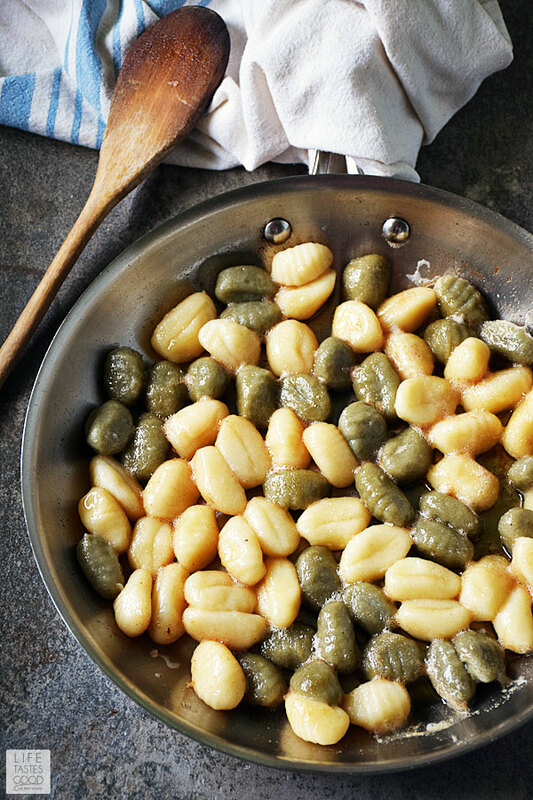 Remove from water with a slotted spoon when gnocchi floats to the surface. Usually this only takes about 2-3 minutes. I remove to paper toweling to allow to drain. Save the pasta water if using in place of the wine for the sauce. Heat a 10" skillet over mid-high heat and melt 4 tablespoons of butter. Allow the butter to brown slightly and then add the gnocchi. 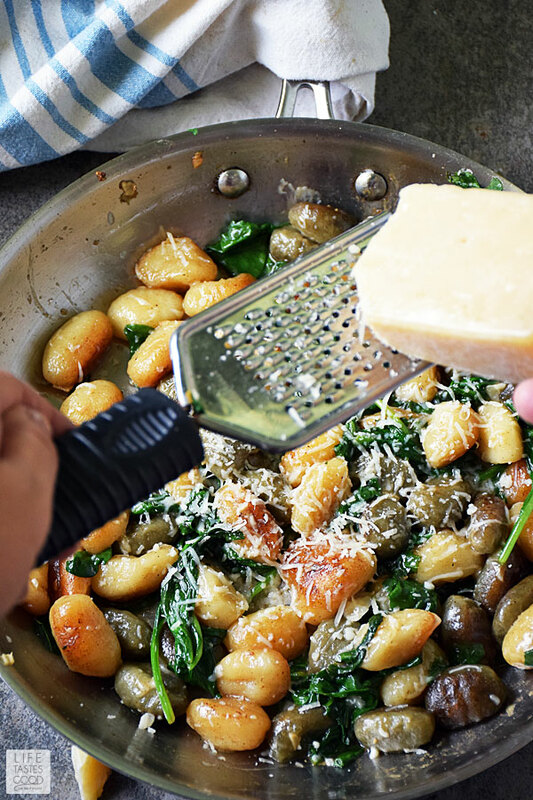 Spread the gnocchi out to a single layer. Allow the gnocchi to sear for about 3 minutes or until the one side is crispy and golden brown. Once seared nicely, reduce the heat to medium and stir the gnocchi. Add 1/2 tablespoon minced garlic and cook, stirring, for about 30 seconds. 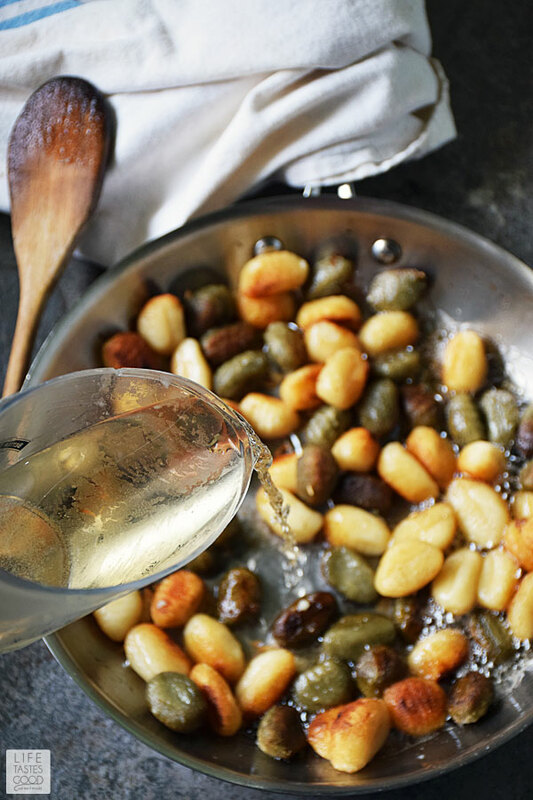 Pour 1/2 cup white wine (or pasta water) into the skillet and allow to cook for about 30 seconds. It will reduce and mix nicely with the butter creating a delicious sauce for the gnocchi. Add 3 ounces fresh baby spinach and a pinch of salt and pepper. Stir to wilt the spinach. Top with freshly grated Parmesan cheese and serve. Enjoy! 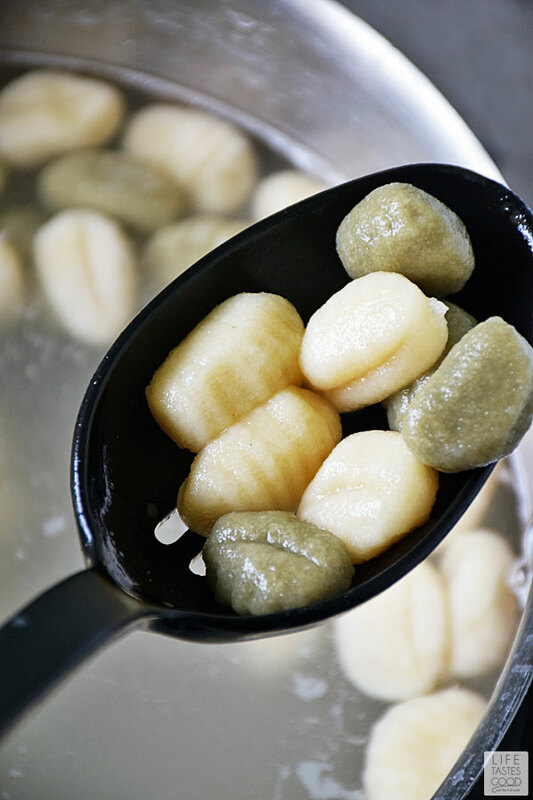 Remove from water with a slotted spoon when gnocchi floats to the surface. Usually this only takes about 2-3 minutes. I remove to paper toweling to allow to drain. Save the pasta water if using in place of the wine for the sauce. It will reduce and mix nicely with the butter creating a delicious sauce for the gnocchi.